Participating in a Danskin Triathlon is an experience like you have never imagined. Thousands of women coming together to warm heartedly compete and cheer each other on. For registered participants, training plans are offered on the site. But how should you eat? Food is fuel and training for the Danskin Triathlon with the proper diet, eating the right food at the right times, will help you train and cross that finish line with a smile on your face. Two things are of the utmost importance as you approach your event day. The first is that you have eaten enough carbohydrates (“carb loading”) to make it through the race. The second is that you have trained for at least two months with the sponsored beverage at the race. For example, if the race is sponsored by Gatorade and you have trained with a different sports drink or water, you may get a stomach ache by introducing a new beverage on event day. Check with Danskin to see who the sponsor is. You can decide from there if you will stock your changing stations with water or partake in the drink stations along the course. Now let’s talk about your triathlon training diet and why it is important to fuel up with the right kind of food at the right time of day. To eat or not to eat before an early morning workout is a question that is bounced around by many people across America. Some people just don’t have time to eat in reasonable proximity to their workout, but others deliberately go without food. One client told me she believed she’d burn more fat by exercising on an empty stomach. Her reasoning was that if no food was available for fuel, her body would tap into its fat reserves. As it turns out, if your goal is to maximize your workout and get (or maintain) a lean body, eating, not starving, is your best strategy. How Food Fuels You. Although your body burns some stored fat when you exercise, its main fuel is carbohydrate that’s been stored in the muscles and liver in the form of glycogen. When your glycogen stores are depleted, your body will indeed tap more of its fat reserves, just as my client anticipated, but at what price? Without readily available fuel, you’re not likely to feel too energetic. When you eat before exercise, whether it’s a large meal several hours in advance or a small snack only minutes ahead of time, you’ll have the extra energy you need for an effective workout. Here’s the reason: Before carbohydrate is stored away in your muscles and liver as glycogen, it enters your bloodstream in the form of glucose (also called blood sugar), a readily available source of energy that helps perk you up when you’re feeling hungry and fatigued. If the glycogen stored in your muscles and liver is low, your body can rely on glucose for fuel; if you already have a fair amount of stored glycogen, your body will use the glucose as a secondary source of energy and spare the glycogen. This means that you have two sources of fuel as opposed to one, so you’ll have more endurance. Something else you should consider is that the muscles and liver can only store so much glycogen. It’s important to “top off” your reserves fairly often, even if you haven’t been doing much. During a long night’s sleep, the body depletes as much as 80 percent of the glycogen stored in the liver. This is why eating a little something before you exercise in the morning can really help. Moreover, it doesn’t take long to deplete stored glycogen during exercise; this process will speed up when it is warm outside. Do I frequently run out of energy during training? 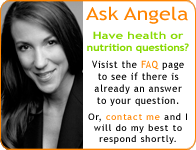 Do I have a quick metabolism…do I feel the need to eat small amounts of food often? Do I often not eat enough food for my pre-training meal? For example, a bowl of cold cereal with milk at 10:00 won’t give you enough calories to sustain energy through your 1:00PM event. Triathlon Diet – Easy to Digest Suggestions : 100% fruit juice, whole wheat bagel, bread or crackers, dried fruit, energy bar (Luna or Lara), fresh fruit, fresh vegetables, rice cakes, raisin bread, small smoothie or yogurt. Here is a snack list to help you pull together a healthy well balanced snack 75% carbohydrate: 25% protein (choose one from each column…the serving sizes listed are general guidelines and will change based on your individual caloric needs). Choose one food from each column below to create a healthy and tasty snack. If you train first thing in the morning, then have your pre-exercise meal the night before, have a healthy snack before you go to bed and then a snack in the morning. The morning snack is essential here…eat as early as possible, without interfering with your sleep schedule. At least 30 minutes before you train, preferably. By eating here, muscle glycogen is synthesized three times faster than if a snack is not eaten here. This happens for two reasons. The first is that increased blood flow to the muscle cells brings more nutrients to make glycogen and the second is that muscle cells are more sensitive to the substances that transform nutrients into glycogen immediately after training. To eat the proper triathlon training diet snack, aim for a ratio of 75% complex carbohydrates: 25% lean protein. Suggestions: ½ turkey, chicken or tuna sandwich on whole wheat bread or fruit, cheese and whole wheat crackers. Pita and hummus, gram crackers and peanut butter, peanut butter and jelly on whole wheat, rice cakes with spread, yogurt and fruit. Are sports drinks necessary? No. You will get more nutrients by drinking water and eating an apple. Hydration is incredibly important…the focus should be on water. Hydration is not about being thirsty as much as it is about your body’s need to regulate its temperature, hydrate muscle cells and remove waste. Carry at least 1 liter of water to each practice or event and make it a habit of drinking consistently throughout the event. This will ensure you are well hydrated, ready to perform and ready to recover. Suggestions: diluted juice (8 oz of water to 2 oz juice), seltzer or 100 percent juice (sparingly). Seattle Nutrition Programs – Get the daily support that gets results! – Locally as well as nationally through Skype.